Days later, Vikings fans are still talking about it, what some are already calling the “Minneapolis Miracle.” With only ten seconds left in the game and the ball on the Vikings’ 39-yard line, quarterback Case Keenum threw a sideline pass to Stefon Diggs, who made a leaping catch and an improbable run for a 61-yard touchdown to defeat the New Orleans Saints, 29–24. 1. NFL Films has designated the “Immaculate Reception” as number one. That’s the play in the 1972 playoffs when Pittsburgh running back Franco Harris, with only 30 seconds left in the game, caught a pass deflected off the intended receiver or defensive back and ran it in for a touchdown to beat Oakland, 13–7. 2. Longtime Vikings fans, of course, still haven’t gotten over the “Hail Mary.” With only 32 seconds left in a December 1975 playoff game at the old Metropolitan Stadium, Dallas quarterback Roger Staubach threw a long pass to receiver Drew Pearson, who caught the ball when Vikings’ defensive back Nate Wright fell. Pearson backed into the end zone to complete the 50-yard pass play and defeat the Vikings, 17–14. Forty-two years later Vikings fans still claim Pearson should have been given an offensive interference penalty for pushing off on Wright. 3. “The Catch” was made immortal by the famous photo on the cover of Sports Illustrated the week after San Francisco defeated Dallas 28–27 in a January 1982 playoff game. The 49ers were trailing 27–21 with 58 seconds left in the game and on the Cowboys’ 6-yard line when San Francisco quarterback Joe Montana rolled to his right and threw a pass toward the back of the end zone that looked too high. Later many analysts thought Montana was trying to throw the ball away to avoid a sack. However, 6-foot-4 receiver Dwight Clark made a leaping catch for a touchdown, and the automatic extra point—a 19-yard chip shot in those days—won the game. If the Vikings go on to win the Super Bowl, Diggs’ catch may become a candidate, but let’s not get ahead of ourselves. First, we have to come up a catchier moniker. “Minneapolis Miracle” is not going to do the job. Secondly, the Vikings have to win two more games. If they lose to Philadelphia or in the Super Bowl, the play could become just another great play in a season that ultimately broke our hearts once again. This year’s team had a lot to like—a veteran assistant coach who finally got his chance at a head coaching job, a journeyman quarterback hired as a backup having a great year, an undrafted Minnesota native becoming one of the league’s best receivers, and a group of players who seemed to be good guys and appeared to love playing together. They have many Pro Bowl–worthy candidates, and picked each other up when injuries threatened to weaken the team. Late in the year I found myself watching the games again, despite hesitations earlier in the season. My wife and I watched the game together on our big-screen TV, a rarity for us. I don’t know exactly what we were thinking when we settled down to watch the game. We were hopeful but didn’t dare to expect too much—probably as good a coping method as any to try to escape the heartbreak we’d experience if the team lost a big game once again. 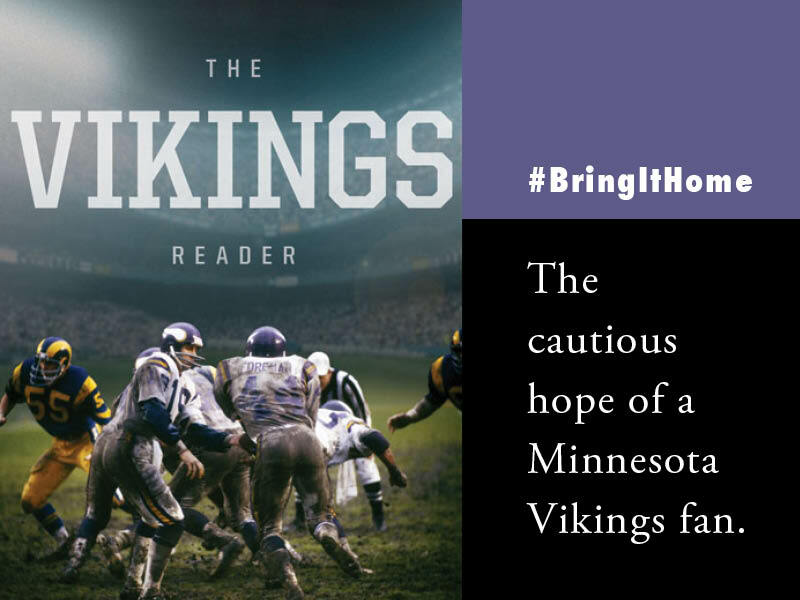 Loyal Vikings fans don’t need me to recite the list of past disappointments; they are seared into our collective memories. Don’t even mention those four Super Bowl losses. So, I was not comfortable with the Vikings’ 17–0 halftime lead over the Saints. That turned out to be good judgment on my part, as the Vikings fell behind in the fourth quarter. I was not overly elated when Forbath kicked a 53-yard field goal to regain the lead for the Vikings, 23–21; and not surprised when New Orleans took back the lead, 24–23 on a field goal with 25 seconds left in the game. I was too stunned to react to Diggs’ winning touchdown. “Unbelievable! Amazing!” were the only words I could utter. I fully expected to learn that there had been a penalty flag against the Vikings on the play, but for once fortune smiled on us. Now what should I do? Jump on the bandwagon and risk another heartbreak? Oh, well, I am going to watch the game anyway. 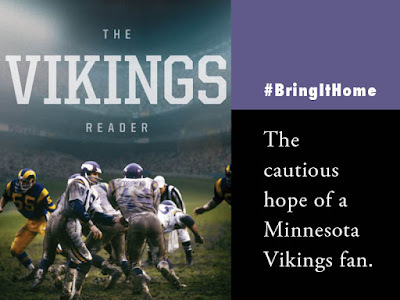 Armand Peterson is author of The Vikings Reader and coauthor of Town Ball: The Glory Days of Minnesota Amateur Baseball.